How weird is this weather? Heatwave last week, two days ago they were ankle deep in snow not that many miles north of us, and then this morning - here comes the sun again! At least we had a good 36 hours of rain, we need it here in dry old East Anglia. My poor pots are going to take a hammering as we've just been hit by a hose-pipe ban due to last the rest of the year! Ok, I said I'd talk about Feed Sacks. These fabrics were literally used to package animal feed. During the Depression Era in the USA, people were hard up. In rural communities, women were hard pressed to afford material to make new clothes for their families. Feed sacks were taken apart and re-used to back rugs, and make utilitarian household items, and sometimes even clothes. Canny feed merchants realised that if they printed their sacks with patterns mimicking cotton prints, women would persuade their farmer husbands to buy that particular brand of feed. The trend caught on, extending to flour, sugar, salt and meal bags also. The sacks would be re-cycled to make clothes, and when these wore out, they would in turn be re-recycled to make quilts. Many of these exist today, and they have become collectors' items. These examples are taken from a book called "Sugar Sack Quilts'" and it's by Glenna Hailey. In the 1980's, in response to the modern quilting boom, reproduction versions of the old feed sack fabrics appeared, and a new generation of quilters discovered their appeal. I doubt if many of those users of the original fabrics would approve of this new trend, as they would represent a time of poverty, and possibly shame. We younger women hold them in regard for precisely their humble and practical origins. You will find heaps of other books on the subject, and if you search on google, you could probably write a doctorate with the deluge of information you'll find. Now, a little about the craft fair which I'm working towards. It's to be held at Drove Orchards Farm on May 7th, the Bank Holiday Monday. If you're within driving distance of North Norfolk, the venue lies between the villages of Holme-Next-The-Sea and Thornham, on the coast road. They held a successful Christmas Market last year, and propose five more events in 2012. I'm delighted to be having a stall, my very first! Below are some glimpses of a few of the items I hope to be selling. Phew, got a bit carried away there! Having only recently started to feel reasonably confident at uploading photos I'm finding it a bit addictive! Mind you, having said that, I know I enjoy blogs with a bit of colour and eye candy as well as the textual content. So I hope you enjoyed this small selection; there will also be quilts, bags and jewellery on the stall. We are at this moment having an extended Good Friday breakfast. J is tackling the Independent's crossword, I'm blogging, and the sun is streaming through the dining room windows - though it is 'crisp' outdoors. A lovely easy day ahead of us before the busy week-end; my mum's 90th birthday, with meals out, family celebration at ours - and the cooking and preparation that entails...all good fun! I hope your Easter is equally busy and happy in which ever way you spend it. See you next time! 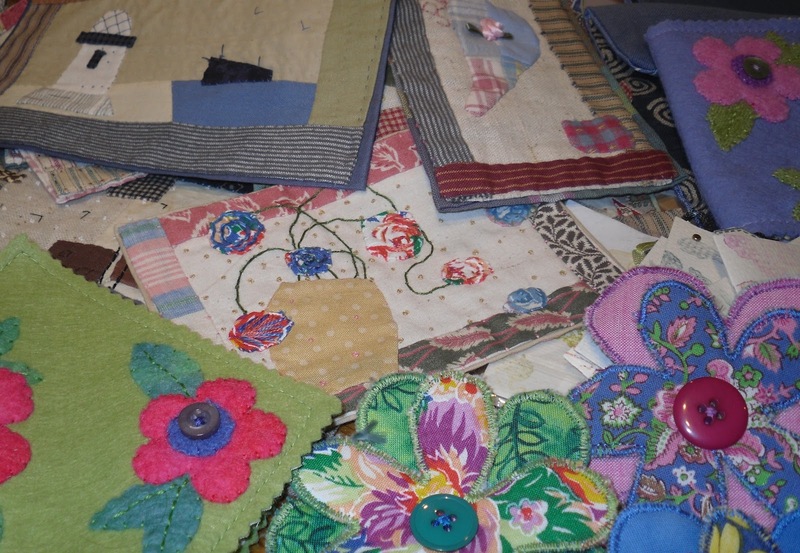 Love the pics of the feed sack quilts and stuff - good luck with the craft fair. Thanks for popping by to visit, Mel! Here is the URL link thing......I found you via Henhouse, I think, I was blog hopping a lot today! Great, there you are - in the blog-roll! Tah Dah! Well it's been lovely vising your blog, I have to say it looks really fabulous so far - I'd never have guessed you were new to blogging :) I'll be sure to check back regularly and will no doubt bump into you in the shop again at some point. Look forward to chatting with you again in the future! Best wishes, Laura. Laura, thanks for your comments. I've done a bit of dyeing with Procien dyes - you get a really lovely 'hand' to your fabrics when you dye them, which commercial fabrics never seem to replicate. The indigo dyeing was at a workshop when I was a memebr of Anglia Textile Works, aart quilt group. We met at a member's home and prepared our fabrics shibori-style, and then dyed them using real indigo. The results were amazing! All different, so many different ways to stitch'tie your fabric prior to dyeing. I still have a few precious scraps, they'll get used up some day no doubt. Like you needed another book! But glad you're enjoying it, Katy, she is a great quilter and author; I have another 2 of hers and they are still as fresh as when I purchased them.